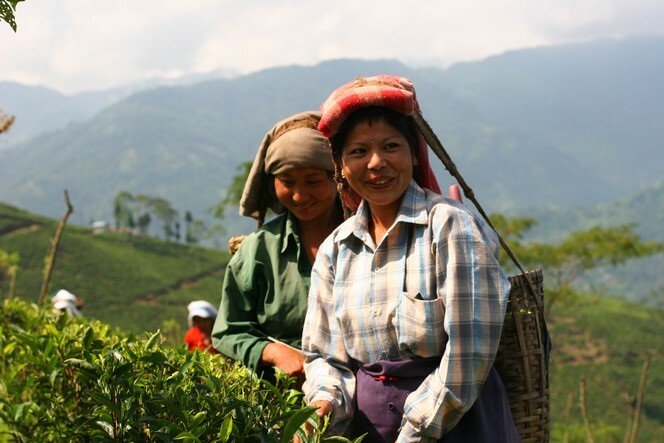 The state of Assam (India), the country’s main tea-producing region, is going through a difficult period. Security has been an issue here for years. I don’t want to go into the detail of the reasons behind the violence. I don’t know enough about it. 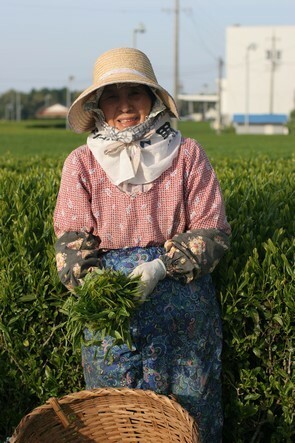 I just want calm restored, like the lovely calm expression on this Assam tea plucker’s face. 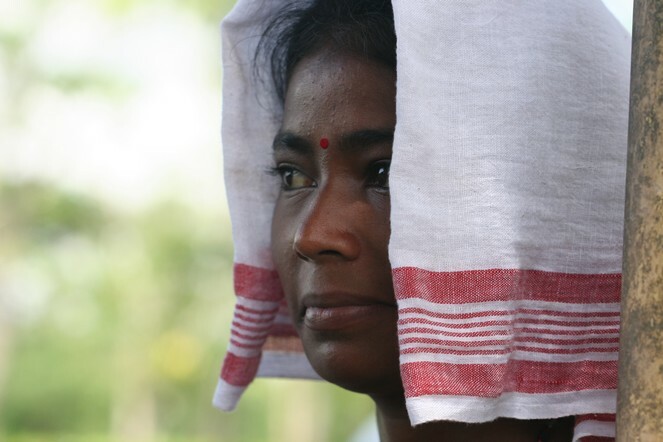 The red and white fabric she wears wrapped around her head is typical of women in the region. Many of you would probably say that you make your tea perfectly well. But can you imagine yourself up on stage, performing under the spotlights while a commentator stands beside you with a microphone, detailing your every graceful move to an attentive audience? 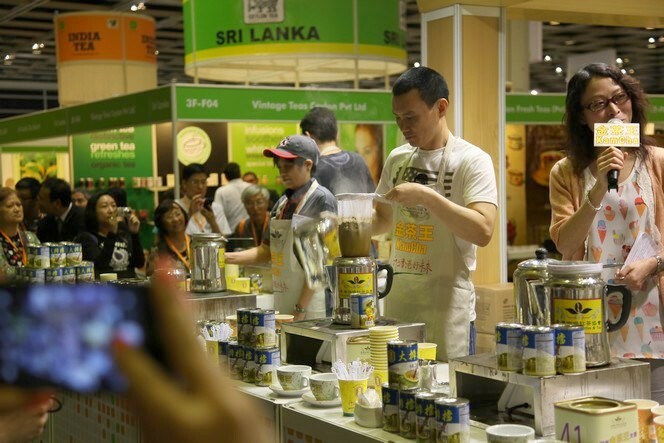 This is exactly what is happening at the moment at the Hong Kong Tea Fair. 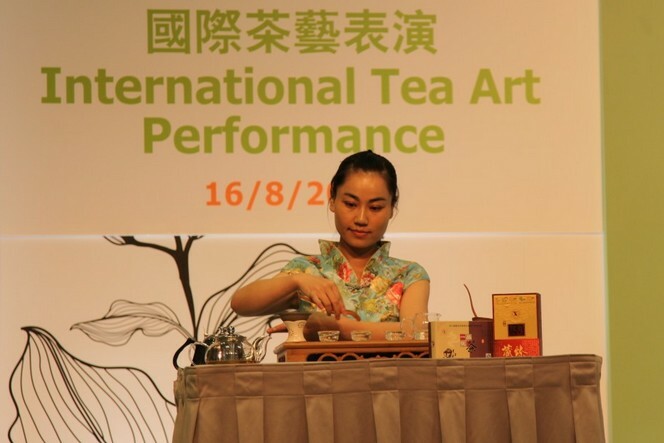 The Hong Kong tea fair is taking place at the moment, and the context is particularly difficult for western buyers. For the past few years, erratic weather conditions have affected harvests, and the quantities produced have fallen sharply. In addition, production costs, whether in India or China, have risen considerably, as has the cost of sea freight. What is more, the very low value of the euro is pushing up the price of tea, which is generally traded in dollars. On top of all this, in China and India, the world’s two biggest tea producers, the middle classes, which did not exist in the recent past, now represent several hundreds of millions of people, many of whom enjoy drinking good quality teas. They aspired for so long, and now they have the means at their disposal. So in these two countries the domestic markets have expanded massively, and there are plenty of Indian and Chinese tea connoisseurs who are now buying the best teas that used to be reserved for export only. We can understand them, even if it is costly for us. Good news from Japan! 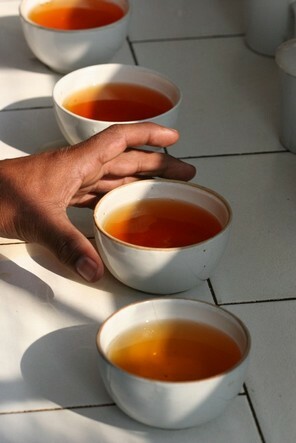 All the teas harvested since the start of the season by the farmers we work with have shown normal levels of becquerels. This is a huge relief for the growers as well as for fans of senchas and other gyokuros. Of course, we will continue to be highly vigilant and to analyse each lot before making it available for sale, to ensure it is completely safe and allow us to enjoy our tea with peace of mind. 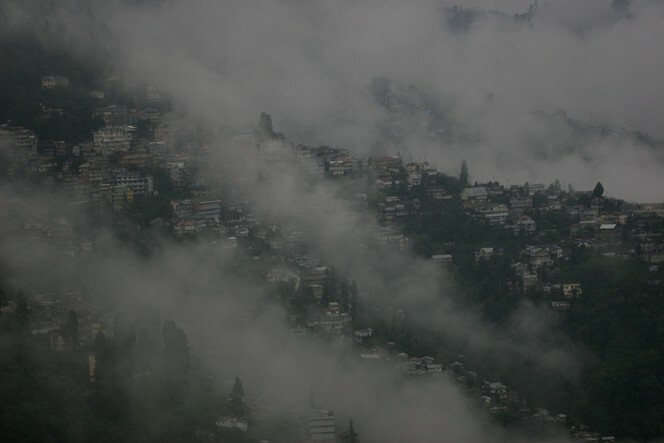 Carine Baudry, who runs the Tea School, travelled to Darjeeling last month accompanied by eight of her students. What a trip! 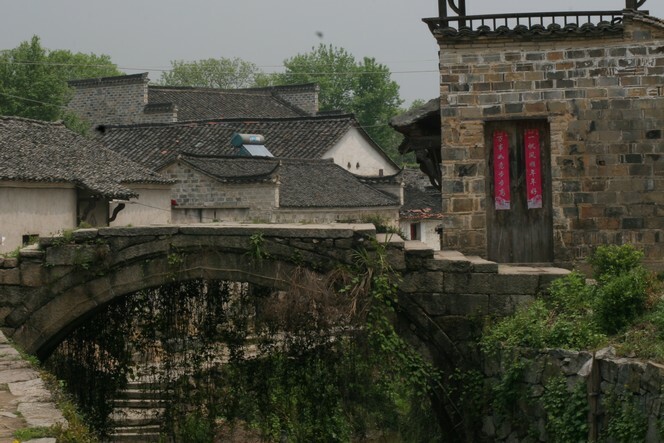 This was a first for Carine, who returned just as enchanted as her fellow travellers, to whom she introduced this magnificent region and the art of producing tea. Carine has often travelled with me in India, Japan and China. But this was the first time she’d had the pleasure of teaching in the production region itself. 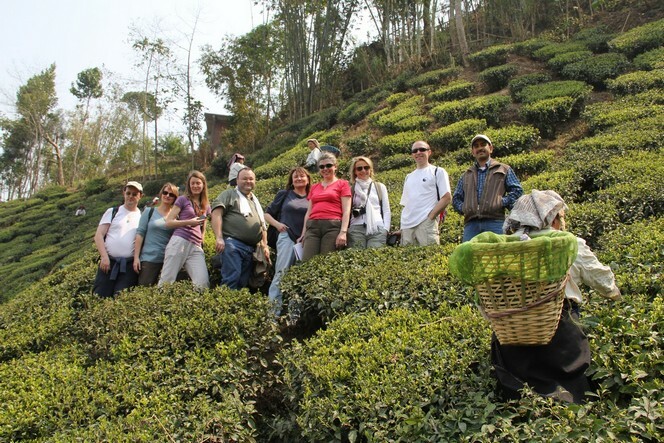 On the right, in the blue shirt, is Rajiv Gupta, manager of the Tumsong plantation. I’ve witnessed a curious spectacle in the streets of Hong Kong on many occasions in recent days. A large, peculiar-looking animal performs all sorts of contortions and dances, surrounded by percussionists playing the cymbals and other instruments. Then it rises up on its hind legs and stands very tall, to the roar of the drums which gains in intensity to increase the air of excitement. It then gulps down a bunch of vegetables hanging high in the air, before spitting out the leaves a few moments later. 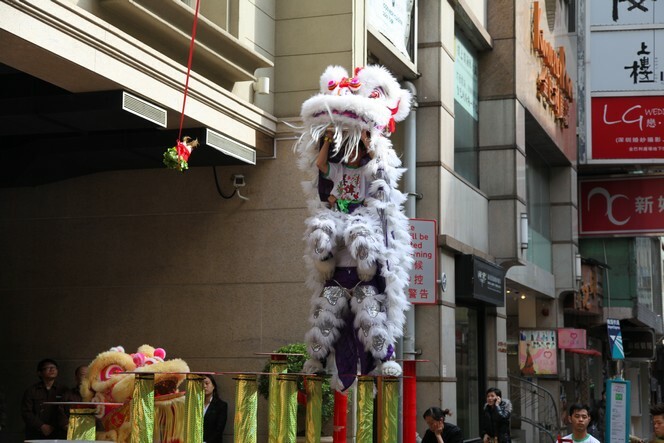 The lion’s dance is part of the Chinese New Year festivities. In Hong Kong, no shop or hotel misses out on a visit from this strange creature. Inside the beast are two Gong-Fu experts, and this exercise demands great skill. So here we are in the Year of the Dragon. Symbol of the Emperor, symbol of power, the Dragon is a highly desirable zodiac sign. May this year unfold under favourable auspices, may it bring you prosperity beyond your dreams, the red signs say. It’s a tradition in China to hang long banners on the doors at the time of the new year, with messages of good wishes.